Sad the Harry Potter saga is over? 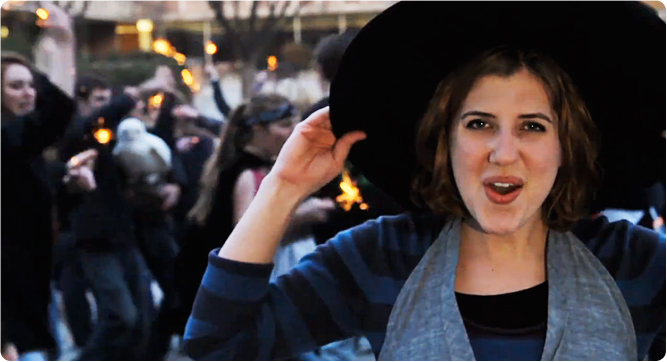 Commiserate with Divine Comedy, the BYU group whose Firebolt music video spoof is approaching 200,000 views and has earned them an invite to the International Quidditch Cup. Watch Firebolt. A human-powered drill built by BYU engineers can tap water 150 to 250 feet deep in a matter of days--and at a fraction of the cost of water-drilling alternatives. The first BYU Football Media Day attracted ESPN, USA Today, and CBS Sports coverage. Watch interviews with BYU legends, players, and coaches. To rank the world's most innovative companies, Forbes turned to BYU professor Jeff Dyer. See the five skills he's uncovered that can help lead to big ideas. Brian Crane's Pickles cartoon entertains readers in 800 news markets. See his favorite strips and hear him talk about his much-loved senior citizens. Check out the online version of the spring 2011 issue of Bridges, the Kennedy Center's alumni magazine. Prepare for the Foreign Service Exam by watching Charlie Wilson's War Aug. 12 with the Foreign Service Student Organization. Assistant counseling professor Michelle Marchant recounts stories from her visit to Haiti after the 2010 quake. A BYU professor who is pioneering open-education platforms won a fellowship from the Open Learning Network. Hear the July devotional given by Brad Wilcox, associate professor of teacher education and popular EFY speaker. McKay faculty Roni Jo Draper is helping teachers improve literacy in a variety of disciplines, from math to music. BYU's Museum of Peoples and Cultures won a national award for an exhibit featuring the archaeology of Utah Valley. Benjamin Ogles, former dean at Ohio University, is now dean of BYU's College of Family, Home, and Social Sciences. See what film won Best of Fest at this year's Final Cut, BYU's annual student-produced film festival. Don Peterson, director of bands in the School of Music, was inducted into the American Bandmaster's Association. Playing off a popular Japanese game show, students made a Wendy's commercial that is winning top awards. Enjoy live performances during Education Week, including Aida and a Disney-themed show by Jenny Oaks Baker. Beginning this fall English students will be able to declare a minor in writing and rhetoric. Previously it was a concentration rather than a minor. As part of the U.S.-Brazil Diversity Project, BYU education majors can trade places with university students in Brazil for a semester. Visit the Bean Museum's newest exhibit, Into Africa, and identify animals with a new iPhone app available for download. A Deseret News piece explores how BYU's innovative research is garnering national attention--and funding. Students helped open a maternity clinic in Ghana, where women said thanks with a bump of their pregnant bellies. Ira and Mary Lou Fulton are sponsoring a new annual faculty mentoring award named after Ira's mother, Myrtie. Graduate fellowship award recipient Laura Shellman hopes to work with minority and underserved populations. A BYU professor mentored students in immunization research. Watch their video on reasons to immunize. Chemistry professor Steven Wood's new interactive website ChemCompanion is part classroom, textbook, and lab. See what Charles Knutson, associate professor of computer science, told BYUtv about parenting in cyberspace. Using his past AIDS research, associate chemistry professor Matt Peterson may have found a treatment for colon cancer. Students, professors, and professionals celebrated mixed models at BYU's Summer Institute of Applied Statistics. Pixar keeps coming back to BYU to hire animation students. Read more in the Deseret News. Watch mechanical engineering professor Larry Howell's devotional address about faith and personal innovation. BYU prepared an amicus brief for the biggest religious-freedom case to go before the U.S. Supreme Court in decades. Tackling irreparable harm in trademark law, grad Jeffrey Sanchez's article took third in an international competition. BYU law student John Kwarm was appointed to the Rocky Mountain Black Law Students Association board. The Law School now uses video conferencing to keep students and faculty connected during externships. Women may be a minority in the business world, but they are a growing presence in the BYU Management Society. See who made the Ballard Center for Economic Self-Reliance's first list of research and teaching fellows. A new release tells accounts of German and Austrian Saints during World War II. Stream sports, devotionals, and your favorite BYUtv programs with the new, free BYUtv app. Watch BYU's Guggenheim fellow Kim Johnson read her poetry on Facebook or YouTube. Read how alumni donations help undergrads contribute significantly to medical science.